How Important Is CRM Convenience? We are used to thinking that convenience is not something that enterprise-level systems would have high up on their features list. However, this is one of the primary reasons why CRM deployments become flops. Let’s take a closer look at how such an evasive parameter as CRM convenience affects buy-in rates within organizations and go through the recommendations on how to make the system a must-have for sales reps – not only because their bosses expect it, but because it naturally aids them to close more deals and saves their time. It’s surprising, but the major opposition to CRM acceptance usually comes from those who are intended to use the system in the first place – sales forces and, to some extent, marketing. They are rarely consulted during a CRM deployment, let alone asked to form focus groups to test the CRM functionality. There are post-deployment gaps too – for example, the lack of user trainings and workshops. As a result, the system gets imposed upon its end users, who, unfortunately, have no idea about its value in their everyday work or just can’t find that value beyond the complex interfaces. Lingering behind this backlash are also the prejudices and perceptions that staff members might already have about CRM, from assuming that automation could render their communication inhuman in the customers’ eyes to fearing that it can replace them as employees altogether. All this results in shamefully low user buy-in rates or kind of silent riots when employees retreat to good old tools like Microsoft Excel, Outlook or, who knows, even sticky notes instead of wasting their precious hours to enter the data they don’t believe will ever work for them. As if it’s not enough, the mission to overcome these barriers can be easily ruined with poor usability and inadequacy of the system itself. Salespeople act at lightning speed, otherwise, their leads and opportunities are gone. They want their data quick and have no time for fumbling, so either they are offered a system to meet these needs or they will prioritize other, more helpful tools to fulfill their work. But how can you use a CRM system that is everything but convenient? When CRM workflows don’t reflect actual processes and policies, the solution requires bulky manuals to make heads or tails out of it, and it’s not user-friendly or anywhere near intuitive? Apart from the much-feared zero ROI that comes with zero acceptance, in less dramatic cases sales reps do get to use CRM. However, poor usability and the system’s failure to adequately reflect business processes affect data integrity and staff productivity. CRM convenience positively influences the quality of data entered. From employees’ reluctance to fill in all the forms and templates properly to downright errors that result either from the lack of staff’s technical knowledge or system faults, the quality of CRM data directly relates to the effectiveness of marketing and sales processes. In CRM generally, information is a powerful tool that helps to improve customer service, grow sales and encourage loyalty, so losing essential customer data can cut performance indicators as well. CRM systems are here to assist in sales, not to become another time-eater. If your staff feels that entering data into an awkward CRM system is a waste of time, probably it is a sign you should take a closer look at its convenience. Entering the data that would lie idle is unlikely to bring positive results to your bottom line, whereas your staff’s productivity will drop visibly. Thinking and judging outside the box is a must if you want to bring everything in order. This is where hiring a consultant who is focused on CRM convenience above all can be an answer. There are at least three areas of CRM consulting that are integral to facilitate a successful CRM adoption at your organization. Cooperating with the system’s end users (marketing specialists, sales reps, customer support) can help to redesign the CRM with their needs in mind. Early at the road mapping stage, define your staff’s roles to be reflected in the custom CRM workflows and tailor the latter accordingly. This can include adopting forms specifically for the sales reps who handle accounts of different sizes or enabling shortcuts for a quick access to required forms. Part of your CRM redesign project or a stand-alone initiative, automating routine tasks can greatly spare your team members’ time and show them direct benefits of implementing a CRM. A case from our CRM consulting practice – the delivery of a CRM component for automated meeting follow-ups for an international Oil & Gas company – can be one of the examples. Such automation can also extend to various functions depending on the nature of your business, from syncing inbound and outbound emails to importing data from Microsoft Excel or distributing leads. Once in, say, every 3 months, launch a small-scale round of UI improvements to keep your CRM convenient and relevant to the minute requirements of the day. This continuous improvement should be based on the direct feedback from end users, specifically from top performers. Such prioritization of employees’ feedback is necessary to filter reasonable complaints about the CRM usability from pure whining (in which we all indulge from time to time). Such little changes, accumulated over time, would contribute to the overall perception of the system at marketing and sales departments as well as increase the scope of its use in employees’ everyday operations. The impulse behind deploying a CRM is to make marketing and sales processes more productive, which would ultimately result in higher, more sustained sales. Because of poor CRM acceptance, though, much of this falls short, not in the least caused by CRM systems being inconvenient and thus not serving their purpose. Yet, a CRM shouldn’t be another cumbersome system imposed from the top, and it shouldn’t be another burden of data administration for its own sake. 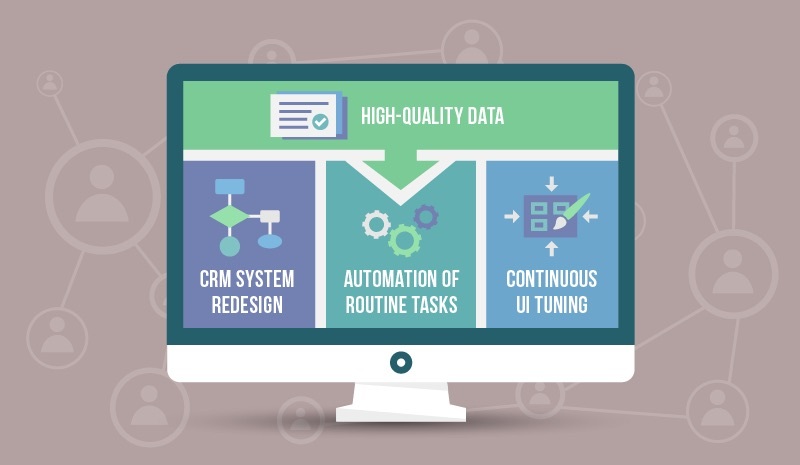 Hopefully, by following the three directions on the way to CRM convenience – (a) redesigning the system, (b) automating routine tasks, and (c) tuning UI regularly, companies can optimize the CRM usability and reach satisfactory buy-in rates that will compensate their CRM investments.